Nationwide, the requirements for complying with commercial energy codes have changed, and there may be new requirements in your state. 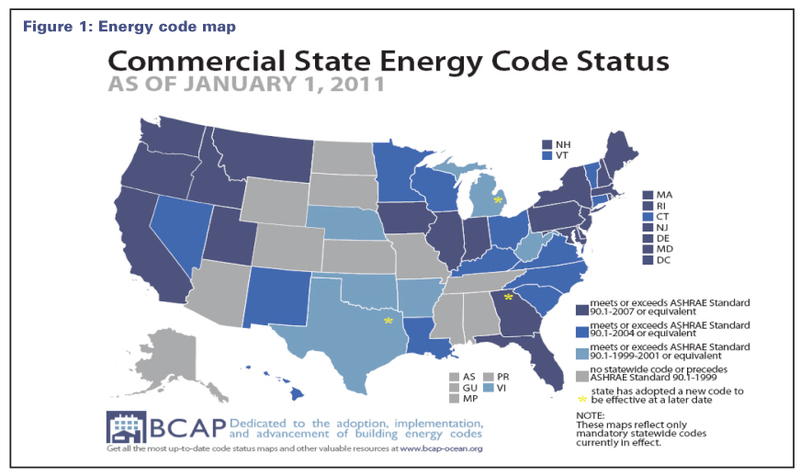 The commercial energy code map in Figure 1 indicates that the 2006 International Energy Conservation Code (IECC), 2009 IECC, and American Society for Heating, Refrigerating, and Air-Conditioning Engineers (ASHRAE) 90.1 standard are gaining momentum, as more states begin to comply with the federal mandate of the 1992 Energy Policy Act, which requires all states to have a policy to reduce energy usage that meets or exceeds ASHRAE 90.1. 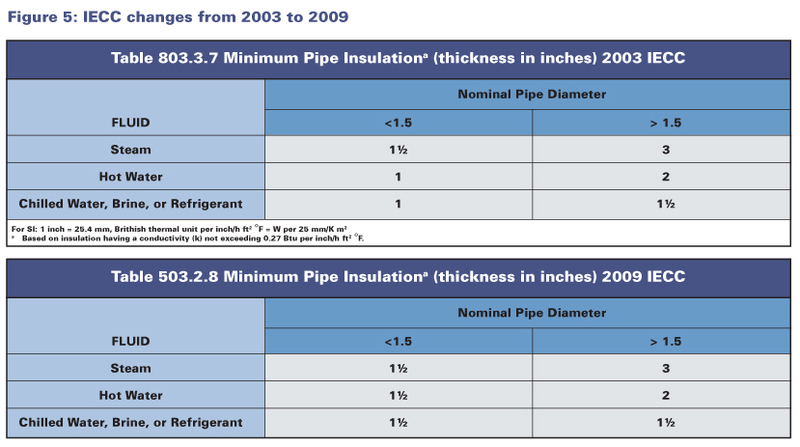 As Figure 1 demonstrates, it is not easy to determine what insulation thickness is needed for energy code compliance. 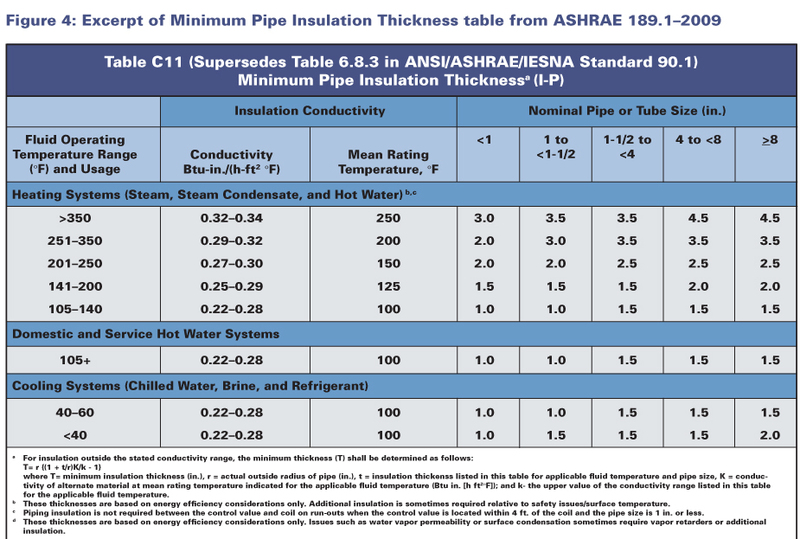 It is important to ask energy code questions before starting the project and consult ASHRAE tables such as the ones excerpted in this article. For instance, consider Table 6.8.3A in Figure 2. To determine the minimum pipe insulation thicknesses needed for 3-in. IPS pipe operating at 300°F, select the temperature from the far left column and then select the pipe diameter from a column in the nominal pipe area. In this example, an insulation that has thermal conductivity in the range of 0.29 to 0.32 at 200°F mean temperature would be applicable. To meet the energy code requirement, a minimum pipe insulation thickness of 4.5 in. is necessary. Tables 6.8.2A and 6.8.2B (see Figure 3) can be used to determine the insulation thickness for both supply and return air ductwork. 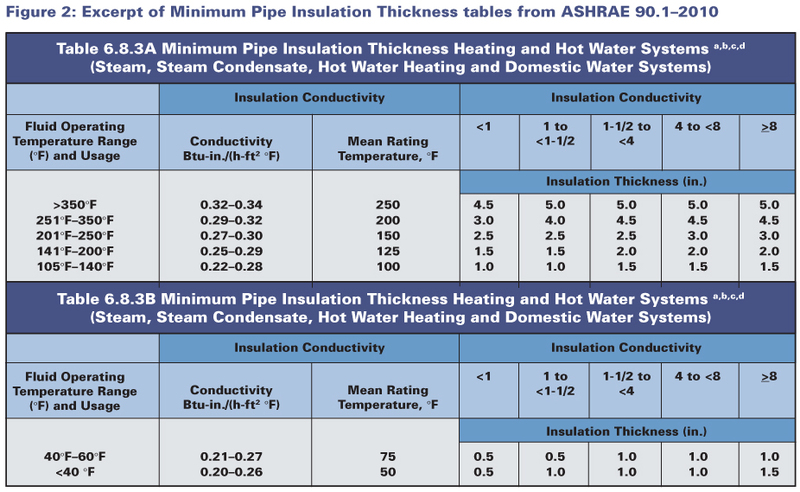 ASHRAE 90.1-2010 includes a new, more stringent table. 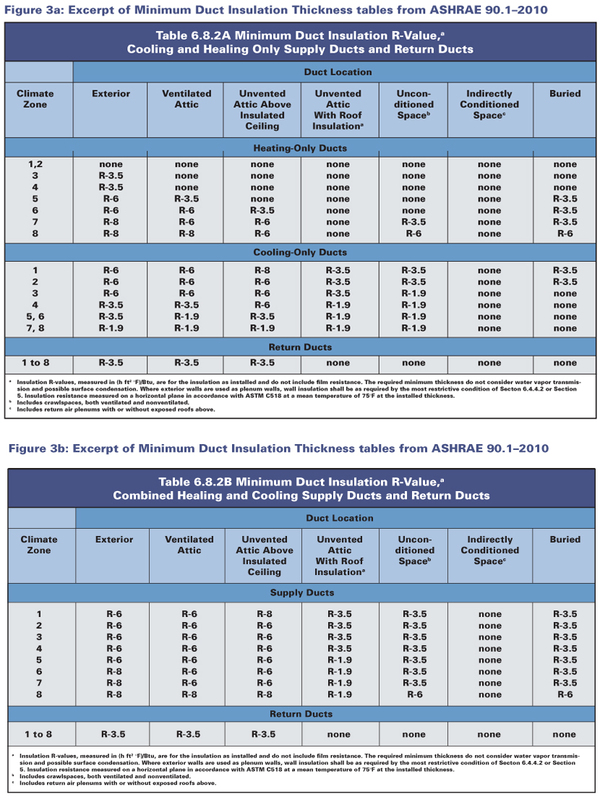 ASHRAE 189.1-2009 and IECC 2009 featured changes to their required energy code thickness tables (see Figures 4 and 5). It is important to understand the energy requirements of the specific job before determining the insulation thickness needed. To determine the minimum pipe insulation thicknesses needed for 3-in. IPS pipe operating at 300°F, select the temperature from the far left column and then select the pipe diameter from a column in the nominal pipe area. In this example, an insulation that has thermal conductivity in the range of 0.29 to 0.32 at 200°F mean temperature would be applicable. To meet the energy code requirement, a minimum pipe insulation thickness of 3.5 in. is necessary. Note if this table is used, then insulation thickness is 1 in. less than ASHRAE 90.1-2010. With the movement toward the 2030 Challenge, which calls for all new buildings to be carbon-neutral by 2030 (http://architecture2030.org), insulation thickness requirements will probably continue to go up. More R-8 and R-5 duct insulation is being specified, and R-values will continue to grow toward R-10 and R-12. With LEED and green building projects increasing and the insulation thickness requirements going up, wall spacing and thickness, as well as pipe chase openings and spacing, will all need to be considered in the design of future buildings. The mechanical insulation industry needs to participate in energy code development, as increased insulation thickness is not always in the best interest of the construction industry. For above-ambient applications, the energy saved is nominal above 2 in. of insulation. For below-ambient applications, the insulation thickness must take into consideration ambient conditions, in particular relative humidity. None of the energy codes referenced in this article consider the insulation thickness needed for condensation control. To learn more about or participate in IECC code development, visit www.iccsafe.org/cs/codes/Pages/cycle.aspx. To submit code proposals to ASHRAE standards, visit www.ashrae.org/technology/page/812. The Building Codes Assistance Project (BCAP) provides assistance on building energy code adoption and implementation. The organization assists state and local regulatory and legislative bodies and helps coordinate others representing environmental interests, consumers, labor, and industry. BCAP can help states that request assistance, using funding from the U.S. Department of Energy. To learn more, visit www.bcap-energy.org.